After conducting an investigation, a divided majority of commissioners of the USITC found no-violation of Adrian Rivera’s U.S. Patent No. 8,720,320 directed toward a re-usable K-cup that work with coffee pods. Investigation No. 337-TA-929. In particular, the decision found all asserted claims invalid for lack of written description. On appeal, the Federal Circuit has affirmed — finding substantial evidence supported the Commission’s holding. 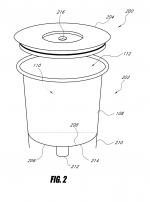 The original set of claims focused on a cup (brewing chamber) designed to hold a “pod” using a “pod adaptor assembly.” However, during prosecution, the patentee cancelled those original claims and replaced them with ones more broadly directed to a “container . . . adapted to hold brewing material.” The expansion captured within its scope competitors who created reusable K-cups that hold loose grounds (instead of pods) that include a filter integrated into the cup. Section 112 of the Patent Act requires the patentee to submit “a written description of the invention.” Timing-wise, this Written Description Requirement is been interpreted require the full description at the time of filing of the application. The difficulty for many patent applicants is that the scope of the claimed invention can change significantly during prosecution through the amendment process. Problems arise both when patentees attempt to narrow claims to overcome prior art and also (as here) expand claim scope to capture market developments. During prosecution, a written description problem is usually identified as improper “new matter” and is correctable. During infringement litigation, however, a claimed invention lacking sufficient description in the specification will be found invalid and unenforceable. The test for written description is an objective inquiry that considers whether the original specification “shows that the inventor actually invented the invention claimed.” Ariad Pharm., Inc. v. Eli Lilly & Co., 598 F.3d 1336, 1351 (Fed. Cir. 2010) (en banc). The Federal Circuit considers written description a question of fact. This means that the appellate court gives deference to the lower court/agency determination on appeal. Focus on the Infringement: At the litigation stage, courts (including the Federal Circuit) considering the written description requirement have a tendency to shift its gaze from the claims and instead also include the accused device in the analysis. Here, the court looked at the accused Solofill cups that include the particular differences from Rivera’s original disclosure: (1) Solofill cups use loose grounds rather than coffee-pods; and (2) Solofill cups include a filter integrated into the cup itself. Taking this infringement-focused approach, the claimed “container . . . adapted to hold brewing material” can only work with loose grounds if the container includes a filter of its own. And, the patent specification does not indicate that configuration is part of the invention. As such, the claims fail the written description requirement and therefore are invalid. The outcome here is similar to that of ICU Medical v. Alaris Medical System (Fed. Cir. 2009) and Liebel-Flarsheim v. Medrad (Fed. Cir. 2007) (though an enablement case). Not Enablement: One of Rivera’s failed arguments is that a person of skill in the art could quite easily make the integrated filter since they were already known in the art. On appeal, the Federal Circuit rejected that argument — holding that this argument goes toward enablement, which is separate and distinct from written description. For its part, the purpose of the written description requirement is to prove that the inventor actually possessed the invention – and thus requires disclosure in the specification. Mylan Pharmaceutical LLC v. Aurobindo Pharma Ltd.
To the best of my knowledge, this has not yet been discussed on Patently-O. It affirms the grant of a preliminary injunction, but suggests that the plaintiff is unlikely to succeed in proving infringement under the doctrine of equivalents with regard to two of the three patents at play. The opinion is written by Judge Lourie. Part I of the Discussion concerns the doctrine of equivalents for process patents in the chemical arts. Is this a case of “Move on, Nothing to see here!”? Or is Judge Lourie developing case law to limit the applicability of the doctrine of equivalents in the chemical arts? Distant, can you give us a clue as to why Larry did not believe the patent owner could prove equivalents? After all, Graver Tank was a chemical case in a way where one constituent was substituted for another in solder flux. Trying to summarize. Another disclaimer: I am not a chemist! In an appendix at the end of the opinion, Lourie included chemical diagrams to demonstrate graphically that the chemical structures of aspirin and ibuprofen are very different. On remand, Lourie suggests that the district court might consider applying the “substantial differences” test in place of the FWR test in the context of these claims. But, before discussing this example he analyses the district court’s attempt to apply the FWR test. In the context of the process claims he argues that the “result” prong was admitted, but the district court confined its attention to the “function” prong without addressing the “way” prong. The claim specifies “silver oxide” as an oxidizing agent. The alleged infringer would replace this by “manganese dioxide”. According to Lourie, the district court did not address the possible differences in the “way” by which these compounds performed oxidization. FWR analysis while essentially bypassing the substantial differences test, in a situation where the latter test might seemingly be more appropriate. The claims in the process patents recite a method for preparing a specifically named compound by combining another specifically depicted compound with a third specific compound, viz., silver oxide. Each of these compounds is expressly named, and an infringement analysis must not take lightly the specific recitation of these materials. The district court found that the accused process using manganese dioxide was equivalent to the claimed process using silver oxide. But the court failed to consider whether the key reagent in the process, manganese dioxide, was substantially different from the claimed reagent, silver oxide, and hence whether the substitution for, and omission of, silver oxide left the accused infringer outside of the bounds of the claims. Maybe Judge Lourie is simply setting out to give a lesson in basic chemistry to the esteemed judges of E.D. Texas. Or maybe he has exercised pains in presenting the opinion so as to be appreciated by non-chemists in the hope and expectation that it might be more widely considered. Also, given that this is interlocutory at the preliminary injunction stage, he has a reasoned opinion from the judge to analyse, not an opaque jury verdict to be assessed for “substantial evidence”. And, if corrections need to be made in the conduct of the trial, he can intervene before the case goes to a jury. Distant, thank you very much for this. I am beginning to appreciate that in most circumstances will be literally impossible to prove equivalents involving chemical formulations using FWR. Rather, as the Supreme Court did in Graver Tank, the proof has to show that one of ordinary skill in the art would know that one could substitute one chemical compound for another in a particular process or composition. I have heard numbers people criticize Graver Tank precisely because the way the two compounds in that case performed the function in the solder flux was entirely different. Yet the testimony was that people working the field knew to substitute the one compound for the other. The resulting solder flux was known to be equivalent. Is that first Mylan patent number right? 7,622,992? No, the correct number is US 7,662,992. Inc. v. Sandoz Inc. is? Also, can we take a moment out of our lives to appreciate the awful opinion that is Spectrum Pharm., Inc. v. Sandoz Inc.? I sometimes have a hard time making the difference between an issue of claim interpretation (the one from the Court, not the BRI) and an issue of written description. For example here, is “container” functional language that triggers 112(f) and thus, is not broader than the specification? Is there a substantial difference between a “container” and a “means for containing”? For example here, is “container” functional language that triggers 112(f) and thus, is not broader than the specification? Is there a substantial difference between a “container” and a “means for containing”? Is there a substantial practical difference between the 112(f) invocation and non-invocation? If you construe the claim in means plus it’s going to be limited to pod embodiments (as that is all that is in the spec) and a container is not equivalent to a pod (under the same logic that is used in the WD invalidation), so you’re just turning an overbroad invalid claim into a non-infringement-sized valid one. Either way there’s no liability. And yet, in one case a valid patent remains while in another, no such outcome. Which means that his question remains a decent one. My shot at an answer for you, PiKa: yes, their is a substantial difference and part of that difference is the choice of the applicant to purposefully avail themselves of the benefits of the optional 35 USC 112(f). It is worth noting here that use of terms sounding in function are fully legitimate OUTSIDE of 35 USC 112(f), even though some sAme ones keep kicking up dust on that point. Of course both you and Random are correct on this point, about which you both evidently agree. In one case the patentee has a broad but invalid claim, and in the other the patentee has a narrow but valid claim. The end result of no-infringement is the same, but the path by which one arrives at this no-infringement outcome seems meaningfully different (having a claim still to assert after trial, vs. having no claim to assert). I doubt that Random would take issue with this statement as it is phrase. Just the other day he was telling me that “if you’re not inventing a fastener, and a fastener is not related to the inventive part of the machine, then its perfectly fine to use the phrase ‘fastener. '” In other words, there is nothing objectionable about functional language (e.g. “fastener”) per se. Functional language is only problematic when it is used at the novel and inventive part of the claim. As for 35 U.S.C. §112(f) being optional, who doubts it? Of course, it is also incontrovertibly true that—just like an offeror is a master of his offer—the applicant is the master of her claim. One always has the option, if one wishes, of drafting an invalid claim. Your last paragraph you got too clever by half. Think of the Prof. Crouch coined term: Vast Middle Ground. That paragraph was meant to be too clever by half. I am glad to see that it achieved the desired effect. Of course one can use functional terminology without invoking §112(f) and also without compromising the claim’s validity—so long as the functional language is confined to part of the claim that relates to the prior art. If your invention is an airplane wing that uses a new alloy, you can talk about “fasteners” in the wing without specifying rivets or welded joints, because that detail is irrelevant to your invention. You would do well to describe the alloy in structural terms (x% copper, y% zinc, etc), however, or else you are taking your chances on validity. That’s it. Keep missing the point, Billy, and taking things completely out of context. You’re a very serious person! Yay poker tell of “very serious,” while missing the point that the point I was adding was NOT a “missed point”. Quite in fact, your penchant for obfuscation and attempts to turn an optional claim form into somehow being a nonoptional claim form is part of that sAme ones thrust. Were your ears burning, “Billy? Agreed about liability. Do you know when a Court/Agency will issue a claim construction ruling that limits claim scope based on the written description and when the Court/Agency will issue an invalidity ruling for failure of the claim to meet the written description requirement? I wish that someone could explain that one to me. That is why I said that I expect that the outcome here is very panel dependent. There are many other configurations of judges on the CAFC who would simply have given this claim a narrow construction, and then said that the narrow construction is adequately supported in the written description. Do you know when a Court/Agency will issue a claim construction ruling that limits claim scope based on the written description and when the Court/Agency will issue an invalidity ruling for failure of the claim to meet the written description requirement? In practice, I think there is a lot of bad law out there when the CAFC tries to save claims for people by bending the rules on their behalf. I think an terrible case is when patentee invents Species A but claims overbroad Genus B, but defendant infringes with Species A. In this case the court clearly doesn’t want to invalidate the genus and thus let the defendant go free when he should be liable (not the least of which reason is because that’s clear malpractice on whoever didn’t claim species A) but doesn’t really have a valid claim construction tool to make it happen under the law. Really what should happen there is the claim to Genus B should be construed as being to Genus B and Genus B should be invalidated, and the patent prosecutor is in big trouble while the defendant goes free, but what appears to happen is that Genus B ends up as being construed/constructed as being directed to Species A. …still over-playing the Genus/Species thing, Random. The turtles and the rungs are simply much more closer than you want to admit. Pika, container was specific structure described in the specification. Thus, claiming container claimed specific structure. In the PTO, however, BRI is a nose of wax and container can be anything the PTO wants a container to be. When properly** used (the “R” not becoming a “U”), BRI is not so much the nose of wax that your own favorite group of nine (ab)use. ** of course, it is no given that the Office routinely does such proper use, mind you. Ned, are you saying the ITC was incorrect to find lack of written description? Disclosure of a “pod adaptor assembly” was sufficient to claim a “container . . . adapted to hold brewing material”? Or has Prof Crouch left out some relevant disclosure? No, invention rights. A pod, a pod adapter assembly, and a container were distinct things in the disclosure. The container, as disclosed could not hold the coffee as claimed because it had no filter. solution taught in the specification; and (3) the embodiments shown in the specification would not work without a separate filter. brewing material” be construed as “a container with an integral filter” when no integral filter is shown in the application? >For its part, the purpose of the written description requirement is to prove that the inventor actually possessed the invention – and thus requires disclosure in the specification. This is a fair constraint on claims. And, one wonders how it could be claimed that there are these wild patent applications (note too that patent applications are WAY down over 30 years) that include everything under the Sun. How could that be? How do they manage to describe everything under the Sun in 20 pages? >>Then claims of the type “do it on a computer” need no more specification than the claims themselves. Perhaps the most famous computer scientist in the USA is Donald Knuth. I have spent many hours reading his books. He relied a story about the first time he tried to write a random number generator. (He arrogant and ignorant like Ned and MM). He said he put his best effort in and ran the program and it cycled after only five numbers. He said it taught him a valuable lesson that actually finding methods that work on a computer can be incredibly difficult. But, you boys keep on with your K Street funded propaganda campaign with no ethics. The rest of us will live under the tyranny of the CAFC telling us that the Sun revolves around the Earth while maintaining our integrity and continuing to assert that the Earth revolves around the Sun. How’s that “swamp draining” coming along, by the way? Still amazing to contemplate. Adult human beings — with law degrees! — actually believed the vapid slogans of a notorious con artist and path 0 l0 gical l i a r. And they bragged about it in public. Your attempted corollary does not carry through – at least not as nearly as you want to make it. …and your moniker tells me that you should be aware of PoIR, Math(S) and that “ultimate equivalency,” as Slashdot is IIRC the home of the Math(S) philosophical musings directly on that point. Patent applications are not meant to re-gurge what a Person Having Ordinary Skill In The Art already knows (and it can well be argued that “possessing” does not require such voluminous treatment. But aside from that, how much disclosure is required? In the sense of “turtles all the way down,” at what level does one stop? Do I “possess” something or not “possess” something because I stopped at some arbitrary level that a (later) court deems that I should have continued to some other arbitrary level? Further, if “possession” is to be tied to claim scope, and claim scope is tied to PHOSITA, and PHOSITA is not even set by the applicant and only “emerges” during examination, where do the turtles stop? At the risk of trespassing against good taste, by inviting you to opine on a matter that you have just instructed us not discuss, can I ask you to give an example of a common way that pharma apps claim something that they do not “possess.” I can easily recall instances of claims to matter that an application arguably does not enable, but “possession” and “enablement” are not the same thing (that is the very point that Ariad means to remind us). What is something, in your opinion, that pharma apps regularly claim but do not clearly “possess”? Think of all the failed FDA trials and think of the typical scope of Big Pharma patent applications prior to those trials. Clearly, “possesion” of scope claimed is nonexistent and the (early filed) patent applications reflect a blanket treatment rather than the applicants possessing what they claim – to the scope of those claims. Note as well, that the argument of “well, we need to allow filing before possession because of timing and competition” is a shallow and not compelling one, as the competition also faces the very same FDA requirements. So yes, to your point that enablement and possession are in fact different requirements, the differences (or similarities) are not at point here. (1) Why are you classing this objection as “possession” instead of “enablement”? I am with you in wondering whether enough pharma apps are sufficient at their time of filing, but I guess I do not see where the “possession” problem comes in. They usually describe treating humans (even if only prophetically) in fairly detailed and specific terms. Description is the hallmark of possession, so it seems strange to fault these apps for lack of possession. The problem, it seems to me, is that this prophetic description frequently turns out to be wrong, or to be correct only after fairly lengthy runs of experimental optimization. This speaks to enablement, however, not to possession. (2) I am not sure that failed FDA trials prove quite as much as you think. The FDA can consider a trial to be a failure for all sorts of reasons, only some of which speak to matters of enablement (or possession). If I claim “a method of treating cancer,” then all I need to show enablement is to treat cancer. If it turns out that my drug, in the process of treating cancer, also causes strokes, that is a real problem for the FDA, but not for the PTO. As far as the PTO is concerned (or at least ought to be concerned), if the drug treats cancer, that is good enough to satisfy §112—unacceptable side effects be hanged. The claim never recited a method of treating cancer while simultaneously avoiding stroke, so it is neither here nor there that the drug triggers strokes. Scope of claim (as filed) clearly includes FDA level working. If you fail that, then you clearly did not possess the scope of claim at filing. AFAIK, Big Pharma does not possess (or perhaps more correctly, does not know even if they DO possess) the scope of claim at filing – as witness by the fact of the level of failed FDA attempts. Enablement IS different (as I gave that point to you above), but both are required, and it is abundantly clear that Big Pharma gets “special treatment” that other arts just don’t get. And the “fact” that this is considered to be down along the spectrum of NOT “predictable,” that possession would be even more examined – rather than less so. The leading CAFC cases applying written description against patentees are in the pharma context and applied against the bio industry (big and small pharma) hundreds of times every day. “anon” is just promoting a little myth to make it sound like biotech is “getting away with something.” But the plain fact of the matter is the adults in the room who’ve been practicing in chem/bio have been leading the way in terms of extreme written description compliance since forever. We’re the ones who are still educating the S00per D00per Imp0rtant s 0f tie w0 ft ie s about how to write specs and prosecute applications internationally. You don’t know what written description is all about until you’re prosecuting in the EP. So much (or so little) for that “adults in the room” angle. Your “EP uber alles” angle is another Poker Tell, by the by. I gather that you think you have made a cutting retort, but really you have not. Some drugs have repeated failures in FDA trials, and some do not. Some pharma claims survive §112(a) challenges, and some do not. If it turns out that there is little to no overlap between the claims that survive challenge and the drugs that fail FDA trials, then that would actually prove MM‘s point, not yours. In order to make your point, you actually need to show overlap between the failed drugs and the valid claims. Do you have data to show that correlation? Anon has turned to the dark side of “anti-patentism”. The Ariad Pharma case was emblematic of an issue where everyone in the field practically wanted to blend WD with enablement back in the day. Of course now we don’t have to deal with that, legally, but we do still see those sorts of amendments made, and I’m sure the slip through occasionally. I’m sure this happens in pharma just like everywhere else. But you act like this is an unsolvable problem, but this is precisely why “means plus” developed. You can certainly provide a disclosure of a particular embodiment, and you can certainly claim it in means plus, which gives you (whether you want to believe this or not) the maximum amount of protection under the law. It preserves your ability to argue later that an allegedly infringing device is an equivalent. However, you can also claim in non-means-plus in an attempt to provide some certainty (and to receive a clear and convincing standard) using independent/dependent levels to get an idea of how far your equivalents extend. So yeah maybe after filing there is a determination (either by the office or a court) that your most abstract claim, or maybe even the top two/three levels of abstraction, are all overbroad of what you disclosed, but your fourth level is fine, but you certainly are capable of writing any number of levels you want in order to satisfy yourself that there’s a valid scope there, and you have the means-plus as a catch all. “Overbroad” in the sense that the claim covers literally embodiments not disclosed. The issue is not enablement. Most of the time, in court, construction narrows the claim to the embodiments actually disclosed. However, such a construction does not solve the problem identified by the Supreme Court in Halliburton that it is the apparent breadth of the claim that is the problem. The same Halliburton case that Congress abrogated with the Act of 1952 (see Federico)…? Tell me again which branch of the government assign authority to write patent law to? (1) Federico’s only remark on Halliburton occurs in the context of his discussion of (what is now) §112(f). In other words, to the extent that the 1952 act can be said to have “abrogated” Halliburton, it is only by dint of the fact that Congress changed certain seemingly functional claim terms into structural terms by legislative fiat. It is unquestionable that some measure of greater liberality in the use of functional expressions in combination claims is authorized than had been permitted by some court decisions, and that decisions such as that in Halliburton Oil Well Cementing Co. v. Walker, 67 S. Ct. 6, 329 U.S. 1, 91 L. Ed. 3 (1946), are modified or rendered obsolete,but the exact limits of the enlargement remain to be determined. In other words, Federico is rather tentative. He leaves open the possibility of continued vitality for Halliburton, depending on how broadly the courts choose to construe §112(f). To the extent that courts (as they presently do) permit one to write a claim term sounding in function but not invoking §112(f), Halliburton is very much alive and well. One only avoids Halliburton by availing oneself of the safe-harbor that Congress provided in §112(f). I think “fiat” is not quite the correct choice – notwithstanding any emotion laden into the term. Federico’s commentary has no force of law. Congress did not enact it, and no court has adopted it wholesale as an authoritative interpretation of the statute. Regarding Federico’s Commentary, Justice Breyer’s lone dissent in SCA Hygiene Products (the case that eliminated laches as a defense in patent cases) contains a passage that seems to suggest that Federico’s Commentary is no longer regarded as authoritative by the other Justices. For one thing, the principal technical drafter of the Patent Act (in a commentary upon which this Court has previously relied, e.g., Warner-Jenkinson Co. v. Hilton Davis Chemical Co., 520 U. S. 17, 28 (1997)) stated that §282 was meant to codify “equitable defenses such as laches.” P. Federico, Commentary on the New Patent Act, 35 U. S. C. A. 1, 55 (West 1954). For another thing, there is a long history of prior case law that shows with crystal clarity that Congress intended the statute to keep laches as a defense. Do the claims now pass written description – i.e. Can one simply state the species-genus relationship together with a statement that the genus is being selected/claimed in order to have overcome this WD invalidation? Can one simply state the species-genus relationship together with a statement that the genus is being selected/claimed in order to have overcome this WD invalidation? I would like to think not, but I fear that the outcome in this case might not have obtained with a different panel. I think that Ariad is one of the most subtle and brilliant expositions of U.S. patent law ever written. That decision repays careful reading (and re-reading). The fact that you can use words to encompass a genus (just as Morse did in his claim 8) does not mean that you possess that genus. More evidence of possession of a genus is necessary than just the ability to articulate the boundaries of the genus at a (if you will excuse the phrase) “high level of generality.” You need to give either: (1) a description of the structural features common to every member of the genus; or (2) so many specific examples that we can infer inductively that you really have conceived of the whole genus, and not merely bits and pieces of the genus. Merely adding a disclaimer to the spec to the effect of “just because I only show pods, please do not imagine that I have only conceived of the invention using pods” should not cut the mustard. If you want us to believe that you really have conceived of embodiments that do not rely on pods, prove it by telling us something about these non-pod embodiments. The fact that you can use words to encompass a genus (just as Morse did in his claim 8) does not mean that you possess that genus. Manifestly true, as 112b and 112a are different requirements. I just wish that the Office understood what you are saying. Let me give you the issue that I always come up against. Applicant decides he can make money with an app that (for purposes of this hypo we’ll call novel and non-obvious and place it at the appropriate year of discovery) takes an input of your location and your destination and calculates the fastest route and provides an estimated time of arrival. Applicant may or may not disclose an equation which transforms the inputs to the outputs, or he may or may not provide an algorithm for doing so, but he will most assuredly state that both any disclosed equation or algorithm is merely exemplary and that the inventor contemplates the use of any function which takes those inputs to generate those outputs. (If the inventor is feeling particularly awesome, he may ignore the inputs too and claim any computer code which directs you to your destination and tells you how long it will take to get there, regardless of inputs). You can see why this is done: Applicant knows that the equation or algorithm is commercially “weak”, it can be both easily designed around and it is not clear that the public will substantially punish the inferior-quality product (and that assumes, of course, that the disclosed algorithm is actually great and not just mundane itself), and the applicant wants to ensure commercial value of the claim. So this kind of abstraction will take place always – there’s always a motivation to make a more abstract scope, there’s always a determinable broader genus (as its just a restatement of the invention utility) and there’s always an argument that enablement always exists and whatever is disclosed is sufficient to teach the entire scope. The office will not make a rejection in this case. It will not make a rejection whether a single equation or algorithm is included or not, or whether multiple of each is included. The fact that the boundary can be drawn (“code which determines a route to a destination and displays the amount of time it will take to do so” or some such) together with the idea that writing computer software is always enabled is sufficient to defeat a rejection. This would be true even if I could produce a reference (either pre- or post-dating the filing) which uses an entirely different equation or algorithm than the one(s) disclosed in the specification. You need to give either: (1) a description of the structural features common to every member of the genus; or (2) so many specific examples that we can infer inductively that you really have conceived of the whole genus, and not merely bits and pieces of the genus. What is the structural features common to the functional result of performing a mental act? One may be able to mathematically prove that a “best” or “most efficient” answer exists, one may even be able to (though I am not sure here) know for certain that they have achieved that answer. But can one show that they have thought about every way of calculating/coming to a conclusion? What do the words in (2) mean? I am not being facetious here. How do we know the breadth of the genus when we admit that we may not be aware of all the examples within it. That is asking someone to fill up a bucket to, e.g. half full (or whatever amount is “sufficient examples”) without being capable of knowing the size and shape of the bucket. What is the structural features common to the functional result of performing a mental act? I confess that I do not know the answer to this one. It may be that “structural features common to the functional result of performing a mental act” may be an empty set. I gather that algorithms are treated as structural disclosures, but I really do not understand enough about those art fields to know whether this is a legitimate “structure” or just a sick joke perpetrated by some CAFC panel. To the extent that algorithims really are structure, it does not seem unfair to my mind to suppose that if you disclose one algorithm, that you can be fairly said to be in possession of that one algorithm. On the same assumption, if you disclose more than one, that you can be said to be in possession of all the disclosed algorithms. What do the words in (2) mean? Allow me to give a very concrete example that pops up all the time in my line. 1. A recombinant prokaryote comprising a lipase having at least 90% sequence identity to SEQ ID NO:45. That term “90% sequence identity to SEQ ID NO:45” is a purely structural designation, but you have layered on top of it a functional requirement—viz, that it hydrolyze lipids (i.e., that it be a “lipase”). SEQ ID NO:45 is itself a lipase, and therefore most proteins with such a high degree of sequence homology to SEQ ID NO:45 as 90% identity will also be lipases. This is known to the person of ordinary skill, and therefore need not be spelled out in the fashion of a college molecular biology textbook. Just a very few sequences with at least 90% identity to SEQ ID NO:45, however, will be mutated in such a way as to ablate their lipase functionality. You can deal with this in two ways. (2) You can list off some substantial fraction of specific protein sequences within the “at least 90% identity to SEQ ID NO:45” genus, providing examples (beyond SEQ ID NO:45 itself) of those that work and those that do not, so that the molecular biologist of ordinary skill can spot the patterns himself or herself, to know which sequences will hydrolyze lipids and which will not. Great comment and great questions to think about it. The “genus-species” distinction falls to the biological taxonomy of “Domain Kingdom Phylum Class Order Family Genus Species” and does not address the true nature of the gradations of the steps in the “ladder of abstractions” framework. For example, the steps on the ladder of abstraction need not be the same “height” as “steps” from one rank to another rank in the biological taxonomy. I think that this is one of the reasons why Random constantly gets patent law incorrect when it comes to the application of the ladders of abstraction. Well that’s obviously true. The problem, however, is not differing heights of steps, but what the caselaw says about the validity of a particular height – Wabash rules out the inventive aspect of the claim being described by function, and that appears to be the conventional manner of claiming computer software. There are definitely valid and invalid abstractions – that based on a single disclosure AbstractionA is possessed while AbstractionB is not – but FunctionallyInventiveAbstractC is clearly a “not” and that happens to control most of the computer software claims we see. You are not correct – otherwise the option of describing things in “objective physical structure” would not be an option, but would actually be a requirement. Such is not a requirement. the option of describing things in “objective physical structure” would not be an option, but would actually be a requirement. Generically you are allowed to use functional language in a claim. But claims fail because they use functional language where they should have used objective structure. The Supreme Court has never held that functional language describing logic is sufficient to meet 112 because they’ve never been forced to address the issue. Here’s the deal: a decent defense attorney who understands the law will win that case, hands down. That’s why I tell every client: if you have the money and you don’t care about your own software patent portfolio, you can win any software patent case asserted against you. You just have to have a good attorney and you have to be prepared to go to the Supreme Court. That takes money. It doesn’t take guts, though, because the outcome is pre-ordained. Keep [shrugging] as you continue to obfuscate and try to turn an optional claim format into something that is not optional. Grow up already, for cripesake. You have no statute nor case saying that functional language outside of means-plus is per se okay. Instead, functional language, like all other language in a claim, is subject to 112a and 112b tests, and I have cases which state that the language will not meet the tests as a general matter. Show me please the Scoreboard that holds that “objective physical structure is more than just an optional claim form. Question, were these original claims, would they still lack written description support for not having any embodiments of the scope claimed? I am under the impression that, in the USPTO (but not the EPO), the claims are part of the specification and provide their own support. Enablement issues could still arise, however. Then claims of the type “do it on a computer” need no more specification than the claims themselves. There’s no shortage of incredibly ign0rant rich people in Silicon Valley. If only there was a system that could be used to encourage investment in stuff that actually works and would benefit everybody instead of just wealthy people. So again MM knows better than all the tech and venture capitalist. MM thinks that you just wish upon a star that the computer can drive itself and it does, or you just write down on a piece of paper and hand it to a programming boy and he/she will get it working. What a joke you people are. Without question the most revolutionary and difficult science (computer science) is held to be trivial by these K Street paid propagandist. I remember a few years ago when these boys didn’t even know who Turning was. I think Adam Smith had a word about just such a system. But, your boys keep on with your K Street funded propaganda campaign with no ethics. The rest of us will live under the tyranny of the CAFC telling us that the Sun revolves around the Earth while maintaining our integrity and continuing to assert that the Earth revolves around the Sun. Original claims are not per se supported by the original disclosure. Ariad is explicit about that. Certainly, Ben. If the claims are claiming functionally, the claims cannot provide full WDS for the full scope. The contrary is true if the claims actually claim ranges and the like that are specific, but are not otherwise disclosed in the specification.